The US Army utilizes Tippmann paintball markers in the training of our soldiers here in the US and overseas. Training with paintball guns can replicate the sense of real combat in an enviornment that is safe. 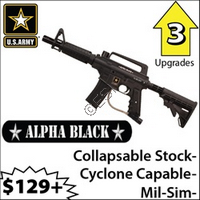 It was only natural for the US Army to work with Tippmann to bring to you military realism at an awesome value that won't cost you your first born. With US Army paintball guns, you will be able to play smart… play strong. Army Strong. bring tactical realism at an amazing price. Want your paintball gun to be reliable and look like an M16? 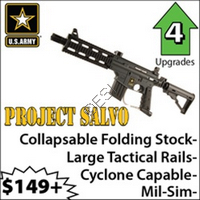 include a collapsable stock and large tactical rails. Quickly becoming the best selling Tippmann Paintball marker.